This year's Lumpy Waters kayak symposium was phenomenal. It turned out to be both epic and charmed...just a mere couple of days before the fun was scheduled to begin, the swell on the Oregon coast was 17 feet at 18 seconds! By Thursday (the day before the symposium started) it had diminished to about 9 feet at 12 seconds. I arrived that afternoon, hoping to get in an afternoon surf session, yet when I showed up the conditions looked quite intimidating; huge, spilling waves were forming up about 2 to 3 hundred yards from shore, then reforming into massive mangling dumpers, thick and laden with sand. Using my binoculars, I was able to guess the identity of a lone boater solely by the craft he was paddling--the new P&H Delphin 150. Jamie Klein landed within a few minutes and looked beat but triumphant. "It ain't small" he understated, and I nervously donned my drysuit and other gear, to have a try with this smaller-sized Delphin. Getting out through the shore break was an exercise in strategy and stamina. "Strategy", in waiting for a lull between sets. If one waited too long, he/she would get nailed further out (and more violently) by the inevitable larger sets following the lulls. I squeaked over and through, and by the time I got to the outside, I felt like I'd just run an eight-minute mile; I had to take a short breather before trying to surf. I had about four surfs in all, always trying to exit the wave before it steepened and dumped, and I remember having one spectacularly long ride. On my last one I got greedy, dumped upon, and my spray deck imploded. Turns out, it's a size smaller cockpit circumference than the Delphin 155. I'm a medium-sized guy, and weigh about 150 with my gear on. I found the Delphin 150 a better fit for me, and a little easier to control in the surf. Pivoting on edge to reposition in the surf zone is really quick and easy in this boat and, like it's bigger version, it's quite forgiving when using the foampile to assist in changing direction while surfing. All in all, it'd be the better size Delphin for some one like myself. The symposium started off with a bang this year. Friday morning, a small crew of us headed out for some great surf-boat surfing on some uncrowded waves. A short meeting and lunch found us all eager to begin classes. One particular class that afternoon ended up being a real-life incident management scenario which involved multiple capsizes and swims in the surf zone, opportunities to sort out swimmers separated from their boats, and arduous tows. Outside assistance was summoned very quickly, as the leaders determined that it was the quickest way to get people out of the water and safe on shore. Though not fun, and certainly a preventable occurrence, there is no such thing as infallible leadership. The best we can hope for is that everyone remains uninjured and alive, and learns some lesson(s) which can be applied to their ability to make decisions and manage stressful incidents in the future. Sat. image of the entrance to Netarts bay. 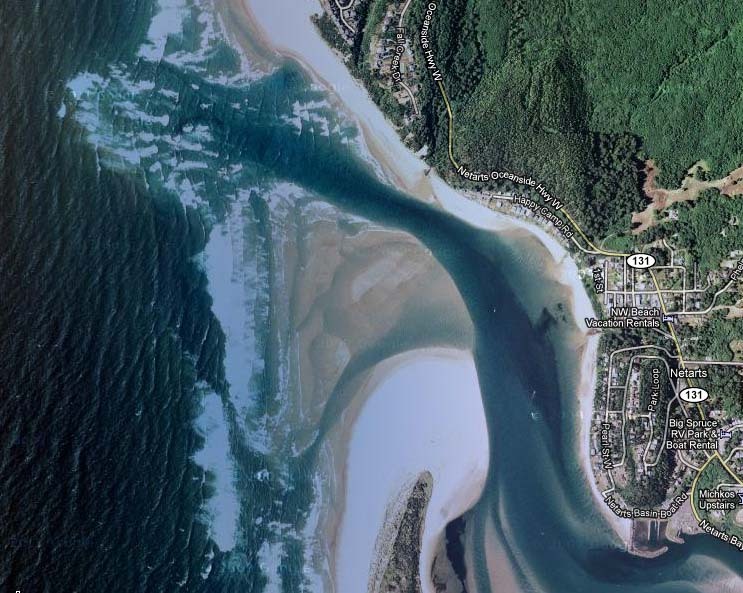 The incident lasted about two hours, and served to put all leaders and coaches on their toes with regards to appropriate venues, and the risks associated with using estuary entrances and river mouths on an ebb. For a detailed account of what happened, from the perspective of one of the leaders and coaches present, check out blog.redalderranch.com. There was a theme of progression throughout the weekend, with a nice emphasis on safety and rescue classes happening before, say, Rock Gardening. Or-- the Fear To Fun and Fun and Feedback classes giving newcomers to the surf a safe, fun entry into that zone, with Advanced Longboat Surfing classes offering an opportunity to hone existent (and new) skills. There were also a couple of great day-trip options running; a chance to paddle some demanding and dramatic coastline with qualified leaders and coaches. Paul Kuthe did a tremendous job matching students to classes, classes to coaches, and managing logistics the whole while as well, and many Alder Creek staff were also crucial in making this a great event for the third year running. I think a particular challenge in running and coaching at an event like this, is that a significant number of the participants are ready for more challenging conditions and excitement. Many of the students venture out on their own with groups of peers, and when they show up as students, some are looking for that next notch up that will put their skills and abilities to the test. As leaders and coaches, our goal is to find just the right level of stimulus for each individual, hopefully facilitate a memorable learning experience, all the while maintaining safety. I ran classes in Rough Water Rescues, Rock Gardening Safety and Rescue, and Advanced Longboat Surfing. Often, what would have been the most exciting spots to have students working were not conducive to either maintaining communication and visuals on everyone, or being able to offer valuable feedback. That said, upon reflection I realized that each venue that I chose to run classes usually had a good spot where the right level of excitement existed and safety could be maintained. With a bit more time to recognize students strengths, and perhaps a bit more familiarity with the venues, I can now see exactly where I could have spent more time, and how I could have set things up to be a bit more rowdy. The best course of action for any coach at this point, is to make note of these thoughts (on paper, for me), and apply any realizations to the next opportunity to coach. The swell continued to diminish to 5 feet and clean up through Sunday, then was predicted to build over night. A group of coaches made plans to hang out and go for an "after-party" rock gardening/surf excursion the next day. The day dawned bright and the swell had grown--it looked as it had 4 days before, when the swell had begun to diminish into about 7 ft. Oceanside was the call, and we made the jaunt up the coast (including huge detour). Once there, we looked at conditions on the beach to make sure it was feasible. After watching for a few minutes, we noted one or two rips which could aid our way out through the surf zone, the added depth often easing the violence of the break. We were 9 on the beach, ready to go, and broke up into groups of three (one radio per group). After agreeing on a channel, a couple of one pod took to the water, and wisely held position in the soup zone to wait for a break in the energy to get out. I had spotted a decent rip to the south, and some folks utilized what turned out to be a consistently better one a little closer to the headland. Seeing a lull in the energy, I snuck out, just making it before another big set closed out the whole area. All but one of our party ended up making it out, and our friend on the beach observed that it would have been a half-hour before they could have had a good chance to get through the surf again. Jeff Laxier. Nice, parallel surge. We made our way to the rocks buzzing with excitement--the day was spectacular, the group was stoked, and the swell was impressive. The only bummer was that one of our crew wasn't with us. We made it out to a long, sloping ledge of rock which was covering and uncovering in a massive pour-over of about 8 feet. I had opted out of this move last year, being content to watch Sean Morley style it twice in very committing conditions. This year, I felt more confident, my shoulder was way stronger, and....maybe it wasn't quite so big! Anyway, Sean did it well a few times, and I pushed my luck with three runs over it--the second one being the biggest and the best. Bryant also styled it on a big set which was fun to watch from the inshore side of the rock; he disappeared with the pulling down of the trough, then was elevated way above the feature, timed his push forward a little behind the peak, and cascaded over in a torrent of white water. Sean Morley positioning for the pour over. We moved to a cave area after this and had some exciting (and visually stunning) moments when an exceptionally large set came through. I thought I had allowed plenty of space between myself and Paul Kuthe, who was 75 yards ahead of me in the spacious arch. Sean was to my right maybe 20 yards ahead. A huge set came through and I began back paddling furiously when I saw the crest of the breaking swell engulf Paul completely. He purposefully capsized into the wave to prevent an uncontrollable backsurf into either me or the rock wall to his left. My efforts to back paddle had been mostly futile against the powerful suckback towards the wave. There was just so much water in it that it acted as a giant vacuum, pulling me closer to Sean and Paul. I ended up capsizing--I had edged to prepare for the oncoming whitewater from my left, but this ended up being the "wrong" edge for the sudden and increasing current coming from the same direction. I rolled up, and the next minutes were beautiful with the whole area effervescing, and strong currents churning as the increased volume of water fought to escape. The Wave. An equally big foam pile is wrapping left to right, about to collide with this one. Note paddler on right. Looking uphill...Paul is in foam pile where left side of arch meets with foam. Matt Nelson and Sean Morley being pulled up towards foam pile. Note that Sean is on a seam caused by water being pulled towards foam pile from left and right. Paul visible after rolling up. By now it was time to go, so of course we drug our heels with a solid hour of beautiful surf on some really clean, a-framing 6 to 8 footers, surfing to the right, back into deep water. There was a moment of increased pace when one of us ended up in a bad position and got hit right in the impact zone, looped backwards and sucked out of their boat. The back hatch had also gotten ripped off. We collected the paddler, another of us got the boat (no lines, just barge-towing and pushing) out of the impact zone. We had to abandon the operation briefly when a big set started to break out to sea from us, but we quickly had the back hatch empty and our buddy back in and surfing within a few minutes. The last surf of the day was close to a half-mile back in to the beach. I feel incredibly fortunate to have had such a great day on the water, in a gem of a spot, surrounded by good friends--even the weather was amazing! That day recharged my batteries for a while, and I returned home feeling energized and ready to tackle some projects with a new-found passion. I also felt so encouraged to be preparing to move down to Marin county in November. My sweet has found us great place to live, 5 of the folks out on the water that day live in that area, and the true ocean is only a half-hour away. California, here I come! These waves were sooo nice for surfing longboats. B. Burkhardt. Sean tears it up again...B. Burkhardt. Djuna and I are planning on shifting south for the winter. One of the things I'll miss for sure will be the annual Tofino surf trip which we've been lucky enough to share with great friends and paddlers for 4 or 5 years running. That said, one of our objectives in regards to our living situation is to end up close to the coast, with much easier access to surf. I dream of having the surf and rock gardening so accessible that it's even practical to go for a half day or a few hours. Dare I dream about pre-workday, morning surfs followed by a great Americano and breakfast at some modest soul-kitchen? Of course there will also be other skilled and enthusiastic boaters to share the stoke with and push each others limits, too! 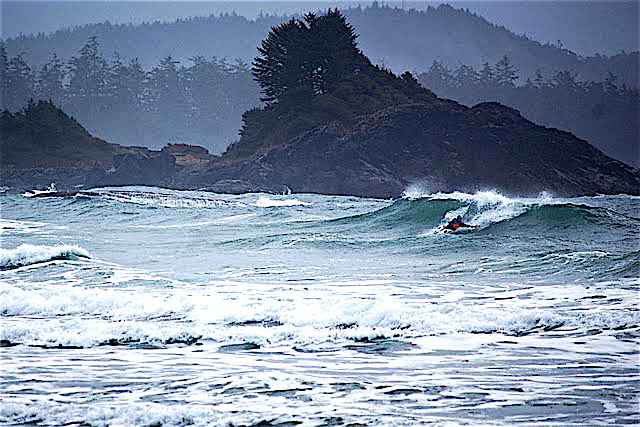 West coast, Vancouver Island surf. Matt in his Valley Rush. This fall will definitely have a surf trip in store, perhaps in Oregon preceding or following Lumpy Waters (a symposium created and run by Alder Creek), or south of Neah Bay--Shi Shi beach. For this trip we'd hike in with boats on wheels, filling the boats with paddling gear, camping gear, and food. Recently, some great friends and myself made what has become an annual late-summer excursion to Sechelt Rapids, B.C. The wave and surrounding areas is a favorite boating location for me, and this year we were rewarded with exceptionally warm and beautiful weather. Current speeds ranged from 11.5, mid 10's, and back to 12.2 on the last day. This translated to a quick steep build, solid 1.5 hours of foam-pile, 1/2 hour of nice green glass, then a quick die-off, inspiring a quiver of sea kayaks, surf boats, and whitewater boats. This trip was also a bit bittersweet for me. On the sweet side I was able to paddle. Last year I couldn't paddle down to the wave, let alone surf, due to a separated AC joint. On the bitter: my sweet love, Djuna, wasn't able to join us on this "best ever" trip--she was missed by all. The opportunity to paddle with Reg Lake. This guy is so inspiring to me; it's happened a number of times now where I've been paddling in some very special and often dynamic spot, sometimes solo, sometimes with a couple other folks, and here comes this paddler from off in the distance. Most of the time it's Reg, paddling his Reflection (his design, built by Sterling Kayaks), adorned with video equipment, and always ready to get right into the mix of things. This time was no different; Reg put together a sweet little video, styled the wave, and raised the vibe of the trip yet another notch. Reg let me try his boat, and it rocks on the wave! It was a treat to hang out, and Reg gives me an example of a life well-lived--something to shoot for. Camping out for a couple of nights down near the wave with an exceptional crew. We all brought gear to have the option of spending the night out and cooking up simple meals on a small island near the wave. Usually for me, these trips have been all about wave time, and while the wave is going, that's still often the case. But not having to paddle back to the parking lot which served as our campground meant quiet time gazing down into the clear water, exploring more of the current features in the area and sleeping under the stars. We set up a big shade shelter, and enjoyed trading stories in the evening sun. Later I got up in the middle of the night and was entranced by the sight of the ebb sieving through these small islands and rocks, bio-luminescence turning the water into a glowing river. Paradise every afternoon. That swarthy dude is Reg! Paddling the P&H Airies. I had been looking forward to trying this boat at Skooks for months, and finally did--for four solid days! The Airies is the composite version of the Delphin, and the added stiffness of the composite hull, the lower-friction surface (gel coat is slippery! ), and slightly lessened weight all added up to very sporty performance and lots of mobility on the wave. This boat is built tough, and it also has enough storage to easily camp out of for days in a row, unload at base camp, then have a play boat for the rocks and the surf. I'm a bit sad I won't get my own till spring. There will be a smaller version of the Airies next season, which will be a better fit for mid-size folks like me, and be a little less boat to throw around as well. The P&H Airies is my boat of choice in exciting water. Hey folks! I'm excited to have been invited back to coach at Lumpy Waters this Oct. 14th-16th at Pacific City, Oregon. If you are a novice paddler looking to venture out into what the outer coast has to offer, this is the symposium for you. 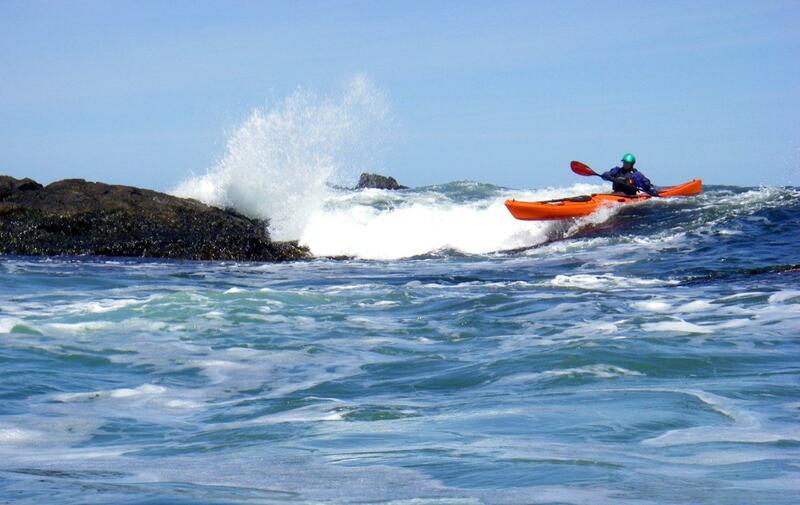 Last year, courses included Intro to Surfing Longboats, Surf Kayak (in short boats), Rock Gardening, Coastal trips, Paddling in Wind, Advanced Long Boat Surfing, and Fear to Fun (very introductory surf zone class), among others. The weather and swell for 2010 LW was too good to be true, and with a healthy number of coaches from around North America, the student-to-coach ratio was excellent, for both coaches and students. Lower ratios mean more individualized feedback, more opportunities to focus on student's goals, and creates a safer situation for risk management, and greater ease-of-mind for students to gently push their limits. If you've been thinking about signing up for this one, take it one step further! Contact Alder Creek or click the link below. Matt Nelson rock gardening class. For those whose passions (like boating, sailing, surfing...) are so dependent on the dynamic qualities of the natural world, a good day often requires that we be just as dynamic and fluid with our plans and lives. The phone service and internet were out of commission yesterday for some reason, so I was unable to do my usual weather check (always on the lookout for conditions which would create relatively exciting paddling). I resigned myself to another day of progress, building a structure on our property--fulfilling, but nothing like a good day on the water. Working. Thirsty. Get a drink in the cabin. Check for dial tone while I'm at it. It 's working! Check internet--it's working! Check email--one from Ted Emery; "short notice, but it looks like it's blowing. I've got the day off--want to go boating?" Check weather--W 40 at Race Rocks, W 27 at intermediate buoy--hhmmmm looks promising. Phone call, formulate a plan, throw my gear together, re-check for essentials, catch ferry, it's going to be a good day. After a short drive, we arrive at our put-in and carry boats down a slippery shoreline. We're psyched to see ample wind and fairly large waves exploding against the exposed aspects of the numerous rocks and small islands in the area, and get on the water smiling. An enjoyable paddle to our favorite tidal race gets us there at slack, and we let the current build as we play on some rare features created by the uncommon wave energy that's present. We weren't sure how the zone would shape up, because max flood today was on the lesser side (3.0 knots), but theorized that the waves would be higher, slower, and lumbering. This turned out to be pretty much the case, and created a great exercise in positioning; too far in the front, and the waves weren't quite fast or steep enough to surf. Too far in the back and the seas were breaking quite heavily with an alarming sound--enough to implode a spray deck or hatch (though unlikely). The wind and the lesser current speed were creating a balanced force on our boats and if we did nothing, we'd pretty much stay in the same position within the race. I was appreciating another opportunity to paddle the P&H Delphin in conditions it was designed for. The maneuverability of the design is a real asset when you're getting thrown around by the sea, it likes foam-pile assisted turns on the wave, and the relatively increased stability allows me to relax some of the stabilizing micro-muscles in the core, reserving more energy for catching waves and making moves. As the wind strengthened and the zone continued to get more intense, we took a break in the eddy to talk risk assessment. This was not a safe situation for anyone without a solid roll and ability to self-rescue. The what-if plan for a capsize-and-swim scenario changed along with the conditions: A group of 3 would be more ideal for any incident--especially one involving injury, towing and support. We were 2 people in a high energy zone, if someone were to swim, their cockpit would be flooded making the boat extremely heavy and dangerous. High likelihood of injury (for both rescuer and swimmer) to try to perform an assisted rescue--teeth and bones are precious!, and the boat would most likely be ripped from the swimmer's grasp or (if they held on too tightly) they could dislocate shoulder or damage hands/arms as they were pulled into more violent breaking waves. Matt in deep (right of center). Starting to get rowdy and fun. If a swim occurred, a re-entry and roll would be the optimal self-rescue. If that failed, and unless a lucky opportunity presented itself, the swimmer would try to keep paddle (for visibility and to aid their progress towards shore) and make for shore or eddy, the paddler would stay with swimmer, offering encouragement and a back deck tow when possible towards shore. Once the swimmer was safe on land, we would assess the possibility of retrieving the boat, communicating with each other via VHF (on our persons) and/or paddle signals. If this seemed too risky, or the boat was not visible, we would broadcast a securite on 16 advising all mariners that a kayak of a certain description had been lost in certain region (lat. long. ), when it had been lost, and (most importantly) that the person belonging to that kayak was safe-- that there was no person in the water. We continued to be played with and tossed around by the sea until we felt that we should "quit while we were ahead" and while we still had energy reserves. We took a longer and more arduous route back to our take-out, paddling against the current (now at max) around two small headlands of an outer island which, though not as epic as the main feature, was also beautiful and exciting. Ted. It wasn't boring going around some of the points on the way back either! We were definitely tired after quite a workout of a day, but very happy. A pint of Manney's followed by the sunset were icing on the cake. I reflected on how lucky I am to be able to have the space in my life to be flexible seizing an opportunity at short notice, as well as to have people who are friends and good boaters to enjoy these places with.